So I woke up this morning to discover that our website was supposedly down. Dwyn called to let us know, and I couldn't connect at all. I could get email though, and since it's all on the same server I found that a little strange. I called the store to let them know I was running late as I was trying to get the website back up and running. Of course their response was 'huh?' The website is fine here. More strangeness. Turns out one of the major pipes (bandwidth) in Toronto was having problems. If you had trouble getting to the site this morning - that's why. It should be all fixed now. In other news, we're super busy getting ready for the bead fair this weekend! The Spring Fair is on Saturday from 10-5 details here. Have fun at the show! Our store will be open, and I'll be working at the store so that Rosemary can go to the show. She's never been able to go, as our store is always open. We thought we'd give her a chance to check out the show. Ok, so with the Bead Fair coming up this weekend we do not have too much going on this week-except for Nadine's fabulous Dancing Dahlia Brooch Class!! And of we have our second Happy Hour Torching Night!! Buy 1 hour get 1 hour free!! The rest of May looks pretty darn fantastic though. Stephanie Dixon's new class the Bling Ring is on Saturday May 9th. 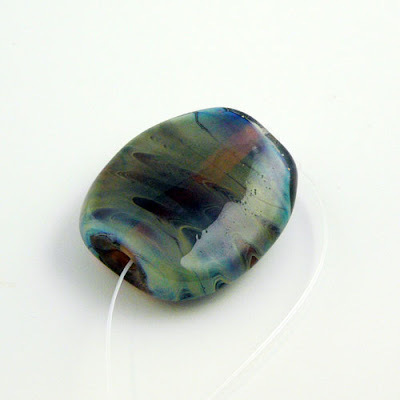 Learn to Make Glass Beads Weekend with Amy Waldman-Smith on Saturday May 9th and 10th. Charmed I'm Sure with Heather Bell-Denison on Tuesday May 12th. And another new chain mail class, the Captive Round Necklace or Bracelet. 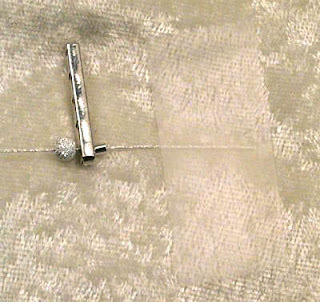 Fine Silver Metal Clay Chain on Wednesday May 20th has one more spot! This is a beginner class. Buildings, Boxes and Birdhouses on Saturday May 23rd has 2 spots left!! This class is an intermediate level class. 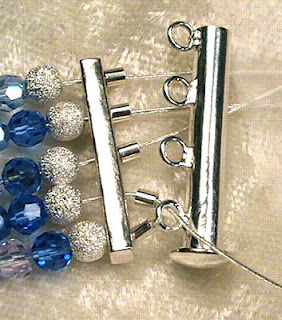 May 26th Introduction to Chinese Knotting: Button Knots with Angela Peace. And on May 29th we have Snake Knot and Phoenix Knot Cords with Angela Peace. Dwyn has a 4 Hour Introduction to Lampworking class on Wednesday May 27th. 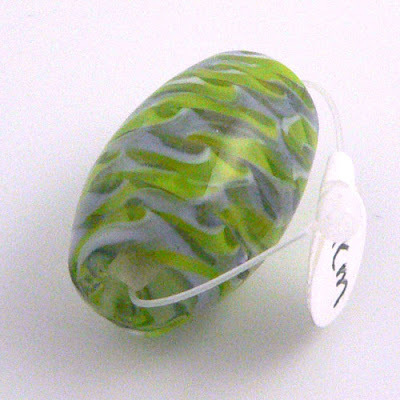 The Lampwork Trunk Show is on Saturday May 30th-stay tuned for details. And we end off the month with Charmed I'm Sure, with Heather Bell-Denison. Don't forget that we have Happy Hour Torching every Thursday in May from 5pm to 9pm, except for May 21st when Kate McKinnon is here. Hope to see you at the Bead Fair this Saturday. Show runs from 10am to 5pm. I can't help it. I really can't... I adore handmade goodies, and even if I can't actually buy all of the things that I covet.. I do love to look. One day, while browsing around it came to me that since I spend too much time there as it is. Some work, but mostly not. It would be a natural extension to offer up some of our goodies on etsy. I ran it by Dwyn, as she is my voice of reason most of the time. I don't always listen... In this case, she agreed with me. We have set up a sister site on Etsy. We've hand selected a few (ok, a little more than a few) items that we are offering up for sale on our etsy site. Things are of course a little different there, one of which being that etsy is all in US dollars. As a Canadian, I prefer to sell in Canadian currency - no choice here. This will of course work out for all of our American friends and customers who will find it much easier to purchase in their own currency. No surprises. 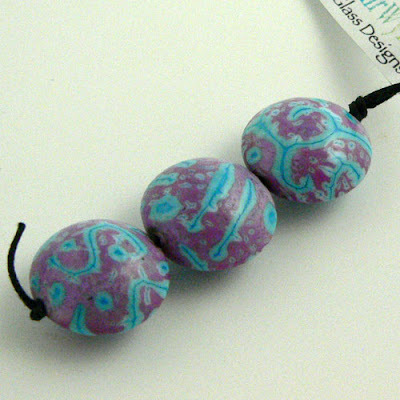 Also, you cannot combine your purchases on etsy with purchases on beadfx.com. The inventory, order processing, and shipping is being handled completely differently. More goodies will be added to the etsy site all the time. It won't be updated any where near as extensively as our main site, and you may find items on etsy that we have limited quantities on, or no ability to restock. It's easier to list those items there. We hope you enjoy the new beadfx etsy site! Dwyn has also set up a new etsy site for the inspirations that she designs for us. 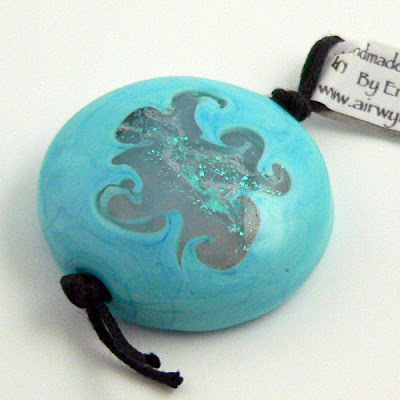 This is in addition to her lampwork site as well.....See, we're feeling the etsy love! 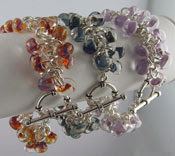 I love this style of bracelet - I made a bunch of them in different colours. This goes back a ways, but sometimes, when sorting through older items - you find they are fresh and new again! The only key thing with making these is to make sure all the strands are the same length - otherwise, one sticks up or flops over and looks goofy. If you did it deliberately, I suppose, with different sized beads and whatnot, it would look ok - but I was going for smooth river of colour look myself. The other slight awkwardness was that I could never find 5-strand clasps to go with the 5-strand spacer bars - so I would use a 4-strand and attach 2 strands to one loop. Slight potential there for getting the tension wrong and having one strand stick up - but it just takes a little fiddling. I find that no one notices once it's done. Make sure your beads aren't too wide for the spacing on the separator too. That will cause bunching as well! I find that 4 mm Swarovski rounds or Bicones work best. Why is the separator even necessary? Well, it is functioning as a connector in this case, and if you don't use it - the strands will flop apart and again, ruin that smooth illusion. The easiest way to get everything smooth and lined up is to do all the stringing first, then secure the strands with crimps. Start with 3 separators, and start threading and laying out your design. 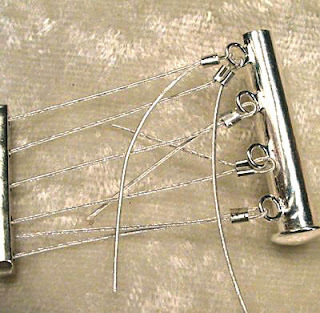 Use some tape or bead stoppers to prevent frustrating unstringing accidents! Secure one end with the crimps, and then slide up the beads and do the other end. And the finished bracelet! I used 3 separator connector bars - which you can use either sterling or silver-plated. The silver-plated is way less expensive! The clasp is a magnetic tube clasp. You'll need crimps and Softflex (I used the Extreme silver.) The space between the loops on the clasp is fairly small - so you might need to get in there with the micro-tipped pliers or smaller style crimpers to get those crimps properly squeezed. It also rocks when made with 4 mm crystal bicones, in which case, I used some small sterling rounds as well. In this case the number of crystals was also 40 x 5 + 10 x 5 2mm rounds. Adjust as required for your preferred length. If you click on this Siam AB (red) one - you can get an image large enough to count the beads and see them clearly. And this last one is the Jet AB crystals. Is this awesome or what? I love the internet - the things you find! A friend, knowing my interest in all things doggy - emailed me these. 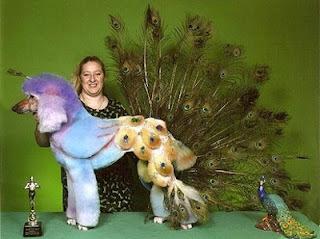 Those are poodles, folks. 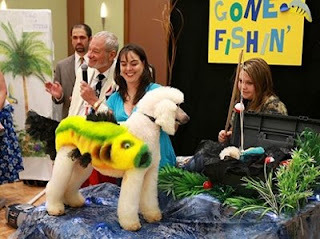 White, Standard poodles - clipped and dyed. 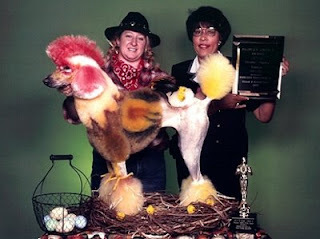 Poodles - I've known a few - are pretty happy, goofy dogs and you have to have a sense of humor to have one. 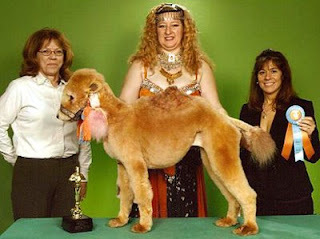 And I think that clipping your poodle to look like a camel is about the best expression of irreverent humor I've seen in a loooong time. 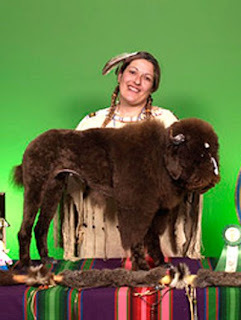 Now, before anybody goes all PETA on me - I did some googling around - and found the website of the owner/groomer of a lot of these. The dog LOVES the attention - how poodley of her! - and the dyes and etc are all non-toxic and are washed out directly after the show. 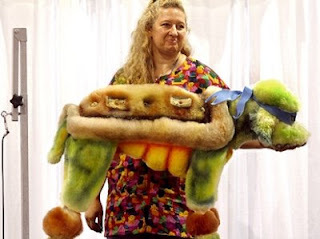 If I had a poodle - I would soooo do this! 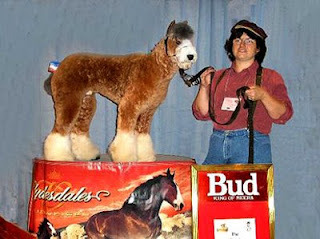 Budweiser poodle! My Little Poodle!! Viva Pinata Poodle!!!! Does "warm and light" resonate for you? 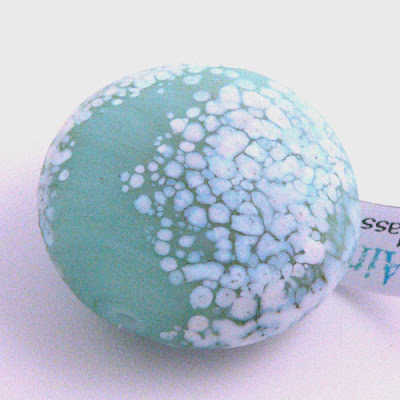 Then you will love our new Natural Touch(tm) Resin beads. In fun candy colours and a silky, matte finish - they are a yummy change for spring! 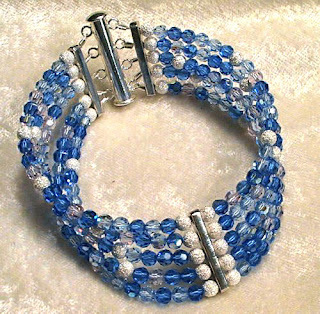 Tierracast has featured a really lovely bracelet using these beads too! Malliga, one of our store staff members just sent this email to our internal mailing list. too bad we don't have these ingredients at the store! tip out onto a plate if desired. 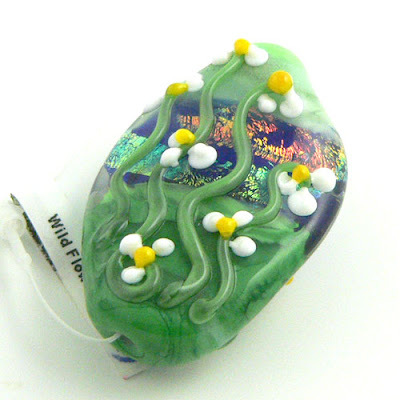 We have a ton of lampwork beads in our retail store by these artists and more! 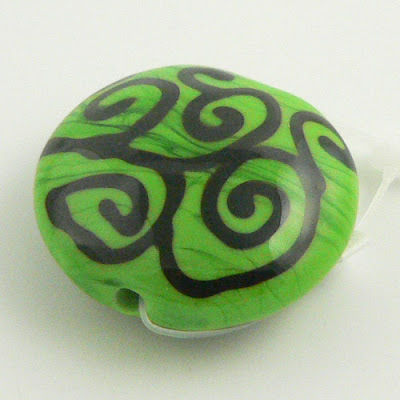 I have scooped a small selection of my favourite lampwork beads out of the store. 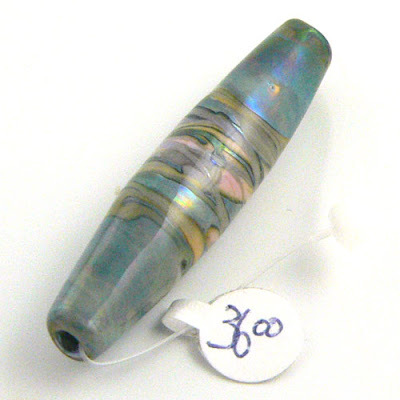 Below you'll find a photo, a short description, and the artist and price information on each bead. If you want it, be the first to send an email to jennifer@beadfx.com letting me know which one you want. If you want to add it to an order, let me know. Otherwise, the easiest way to pay will be via Paypal. I'll send you a Paypal invoice for the cost of the bead, plus shipping and any applicable taxes for you Canadians. My hope is that this will be a regular weekly feature on the blog! First up is a gorgeous floral bicone made by Dwyn Tomlinson. 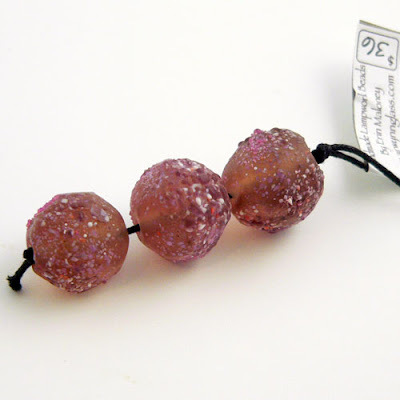 Next up we have a set of three light cranberry nuggets by Erin Maloney of AirWynn Glass Designs. Each bead is about 18mm round. The set of three sells for $36.00. Sold - Thank you! 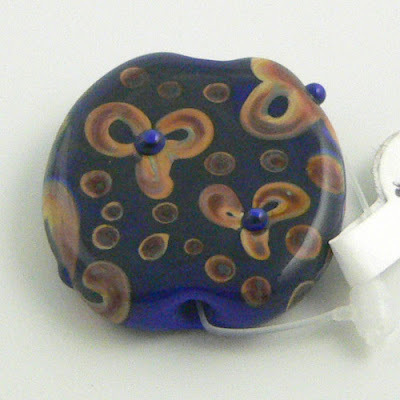 29x25mm - $12.00 - Code: lampwork11 -Sold Thank you! As promised we have a bunch of new Marilyn Gardiner classes this week. Marilyn will be doing a NEW chain mail class each month from now until September. All of the kits for her chain mail classes are available in both silver and copper. Saturday May 16th is her next new class, the Captive Round Necklace or Bracelet. This is a beginner course. Byzantine Rose Bracelet on Saturday June 6th. This class is a beginner plus. It is recommended that students have some experience with a previously completed chain mail project. Foxtail Bracelet on Saturday July 11th. This class is an intermediate class, students should have previously completed a few chain mail projects. Saturday August 8th is her Double Spiral Bracelet. This is a beginner class and no experience or previous class/projects necessary. And on Saturday September 12th is her fabulous Dragonscale Bracelet. This is an advanced course--experience and/or previous classes required. And on Thursday May 29th is Snake Knot and Phoenix Knot Cords. Both of these are beginner classes. Angela will teach you how to make these knots and show you some practical ways to incorporate them into your jewelery designs. We still have some great classes coming up in the next little while too! This Saturday the 25th is Charmed I'm Sure with Heather Bell-Denison. Sunday April 26th Amy Waldman-Smith is offering a 5 Hour Lampworking class. Monday April 27th is Rosemary's Celtic Star Pendant. Thursday April 30th is Dancing Dahlia Brooch with Nadine Foskin--the perfect way to end off the month! Also coming up tomorrow, Thursday April 23rd, is our first Studio Happy Hour!! Torch one hour - get the second hour free. 5 til 9 p.m.
earlier, so if you have questions or need help with a technique she'll be there to help. Come out and bead social! (Please call the store, 416-701-1373, and book your studio time). We will also be at the Knitter's Frolic this Saturday at the Japanese Cultural Centre. Show runs from 9:00am to 4:00pm and admission is $5.00. Parking is free! This weekend is also the deadline for dropping off Corsage Project Donations! Mail them in or drop them off at the store and we will get them delivered on time.